The Soviet Union’s space program had a long series of ambitious but failed Mars missions, beginning with these two attempted flybys. Both craft suffered third-stage rocket failures and failed to reach Earth orbit. 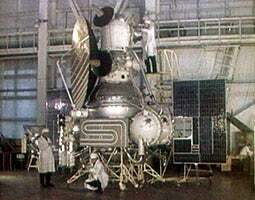 In late 1962 the U.S.S.R. launched two more flyby missions, Sputnik 22 and Mars 1 (pictured), and one lander, Sputnik 24, all of which failed to complete their missions. 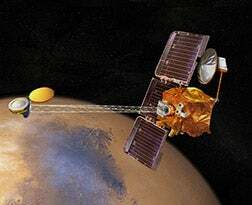 Mars 1 was not a total failure, however; the probe traveled some 106 million kilometers from Earth before mission controllers lost contact, exploring a large swath of interplanetary space. 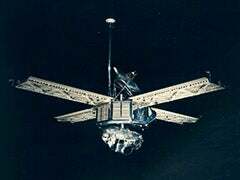 NASA’s Mariner 3, which was intended to fly past Mars, failed to reach its destination when a protective shield did not detach after launch. Its sister craft, Mariner 4, was launched just weeks later but fared much better. 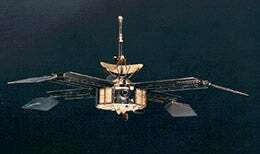 Mariner 4 beamed back 21 images of the Red Planet, showing no system of Martian canals, as had been hypothesized by some astronomers, most notably Percival Lowell, nor any other signs of life. In July 1965, at a distance of about 17,000 kilometers, Mariner 4 snapped this monochrome photo, humankind’s first close-up view of another planet. 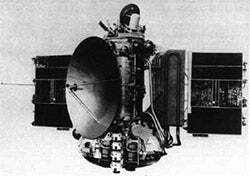 This Soviet flyby mission went awry when its solar panels failed to fully open. Mission personnel lost contact with Zond 2 in May 1965. 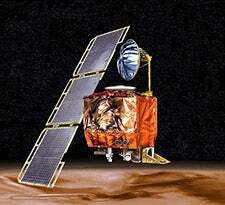 The identical spacecraft, launched one month apart, both completed successful flybys of Mars, returning hundreds of detailed images from up close and from afar. Mariner 4 had shown that Mars was cratered, but Mariner 6 and 7 painted a far more complete picture of the pockmarked terrain, imaging roughly 20 percent of the planet’s surface. 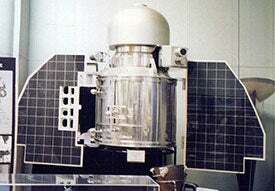 Both of these Soviet orbiters, which were to image the Martian surface, suffered swift mission failures when the Proton rockets used to launch them exploded shortly after liftoff. These twin NASA spacecraft met very different fates. Mariner 8 encountered a launch malfunction and plunged into the Atlantic Ocean. 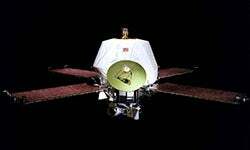 But Mariner 9 succeeded in reaching Mars, becoming the first probe to orbit another world. A months-long dust storm, which obscured the entire planet, was raging when the probe arrived. After it eventually subsided, Mariner 9 mapped the bulk of the Martian surface. Mariner 9 showed conclusively that Mars had seen volcanism in its past, including at Olympus Mons, the tallest volcano in the solar system. In this image from November 1971, Olympus Mons rises above the dust storm. This pair of Soviet orbiters was a partial success. The braking system on Mars 4 failed, preventing the spacecraft from reaching Mars orbit, but the probe but did achieve a close flyby, taking photographs of the planet in the process. Mars 5 entered its intended orbit and in several days of operations returned about 60 images while also collecting data on the Martian atmosphere. 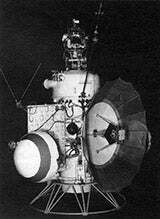 Mars 6 and 7 were intended to be flyby missions with landers. The Mars 6 craft successfully delivered its lander, which transmitted measurements of the Martian atmosphere as it descended to a presumed crash landing. 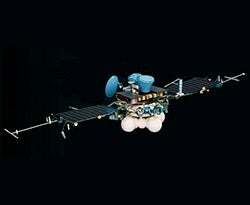 Mars 7, however, suffered a glitch; its lander missed Mars by more than 1,000 kilometers. 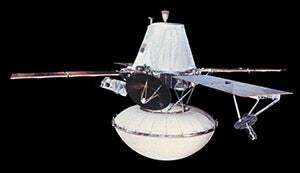 Each of the Viking spacecraft comprised a Mars orbiter and a lander, each of the latter carrying dedicated experiments to detect biological processes on the surface. The two landers, which produced a wealth of images and data, looked in vain for evidence of life in the Martian soil. This image from the Viking 1 lander, taken in July 1976, is the first panoramic photograph ever produced of Mars's surface. 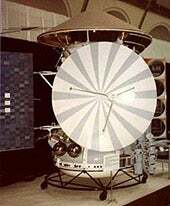 Viking 2 ceased transmissions in 1980, Viking 1 remained operational until 1982. 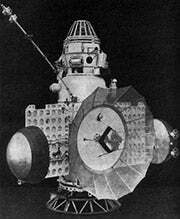 The two Soviet craft were supposed to explore Phobos, the larger of Mars’s two miniature moons, with multiple landers. Phobos 1 succumbed to faulty software less than two months after launch and lost power en route to Mars. Phobos 2 fared somewhat better, successfully reaching Mars, but the craft malfunctioned just before approaching Phobos. As a result none of the landers reached the Martian moon. 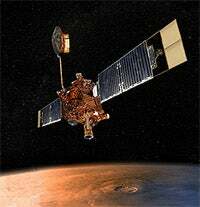 This orbiter was supposed to collect geoscience and climate data at Mars, but NASA lost contact with the spacecraft just days before it was to enter Mars orbit. Investigations pointed to a rupture in the probe’s propellant fuel line, which caused an explosion. If it did survive, without commands from Earth, the silent Mars Observer likely entered orbit on its own or flew past to be captured into orbit around the sun. 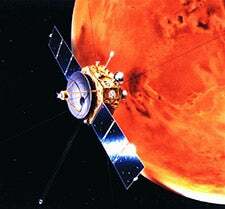 After the loss of Mars Observer, NASA finally ended its long absence at Mars with the successful Mars Global Surveyor (MGS) mission. MGS carried out many of the geologic and atmospheric investigations intended for Mars Observer. Among the MGS scientific instruments were cameras and a laser altimeter that produced detailed topographic maps of the planet. The craft lasted four times longer than planned. Its last communication was in November 2006. The first Mars mission of the post-Soviet Russian space program ran into the same troubles that plagued the early U.S.S.R. attempts to reach the Red Planet. Mars 96 was to orbit Mars and deliver two small landers and two impactors to the surface, but a failure in the third stage of its launcher sent the craft plummeting back to Earth. 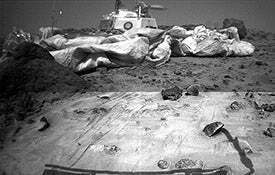 Cushioned by airbags, the Pathfinder lander bounced onto the surface of Mars on July 4, 1997. It soon released the tiny Sojourner vehicle, the first rover to be deployed on Mars. The lander and rover performed measurements of the dusty Martian atmosphere and analyzed the chemistry of rocks and soil. The Pathfinder lander camera photographed the 65-centimeter-long Sojourner examining a rock dubbed “Yogi” with its Alpha Proton X-Ray Spectrometer. This Japanese craft failed to reach Mars orbit after a mechanical malfunction put it on the wrong trajectory. 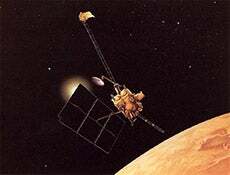 A backup plan to use successive Earth flybys as gravity assists for a later Mars encounter was scuttled when solar flares damaged Nozomi’s onboard electrical systems. The Mars Climate Orbiter was to study Mars's atmosphere, including its water and carbon dioxide cycles. 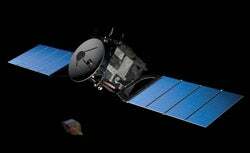 But NASA lost contact with the probe and it plunged headlong into the Martian atmosphere. The mishap was attributed to a mix-up of measurement units between the operations teams—one team used the metric system and the other used English units. This venerable orbiter has been in orbit at Mars since October 2001, making it the longest-serving Mars craft in history. The orbiter carries a Thermal Emission Imaging System and a Gamma-Ray Spectrometer to gather mineralogical information about the Martian surface as well as sniff out the possible presence of water. This map of hydrogen, high concentrations of which indicate the presence of water, comes from Mars Odyssey’s Gamma-Ray Spectrometer, overlaid on exaggerated topography data from Mars Global Surveyor. The hydrogen-rich (blue) area in this image is near the Martian south pole. 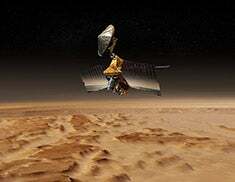 The European Space Agency’s Mars Express orbiter has been orbiting Mars since December 2003, measuring the composition of its tenuous atmosphere and returning detailed three-dimensional color imagery of the planet’s surface. Before entering orbit Mars Express released a U.K. lander, the Beagle 2, which presumably entered the Martian atmosphere but was never heard from again. The reason for the lander’s failure remains unknown. 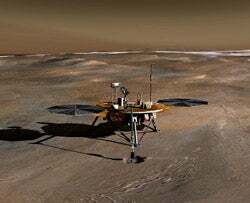 The Spirit and Opportunity rovers landed on Mars in January 2004 to carry out 90-day missions investigating the geology of the Red Planet. Both lasted much longer than that. 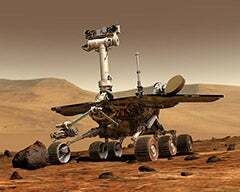 Opportunity is still exploring Mars; Spirit became stuck in soft soil in 2009 and fell silent in 2010. This orbiter carries a number of scientific instruments, including HiRISE (High-Resolution Imaging Science Experiment), the largest telescopic imager ever deployed to Mars, and a radar instrument that has identified massive subsurface stores of water ice. In August researchers announced that HiRISE images revealed transient, seasonal streaks on the surface of Mars. The streaks, which extend downhill over time, could indicate flowing briny water. Phoenix touched down on Mars’s far northern plains in May 2008 to explore the surface there and to serve as a weather station. From its arctic landing site, Phoenix witnessed snow falling from Martian clouds and confirmed the presence of water in the soil. Phoenix dug several trenches to sample the arctic soil. This trench, known as Snow White, showed extensive water frost accumulation as temperatures plunged toward the end of the Phoenix mission in November 2008. 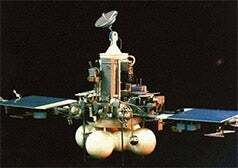 Russia’s bold Phobos–Grunt mission will seek to collect soil samples from the Martian moon Phobos and return them to Earth for study. It will also carry a selection of microbes on the round-trip to test their ability to survive an interplanetary journey. China’s small Mars orbiter Yinghuo 1 will hitch a ride with Phobos–Grunt and, if all goes according to plan, become the first Chinese spacecraft to reach and orbit Mars. This automobile-size rover, also known as Curiosity, will dwarf its predecessors Spirit, Opportunity and Sojourner when it arrives on Mars in August 2012. Assuming, that is, that it touches down safely. The rover has an elaborate landing mechanism involving a parachute, rocket thrusters and a “sky crane” that will lower the rover to the surface. Curiosity carries a variety of cameras and scientific instruments; one of its prime goals is to determine whether Mars was ever hospitable to microbial life.